There are two things that stuck with me upon completion of Night In The Woods - the first is that Mae, the protagonist, is not voiced. The second is that Garbo and Malloy, as well as Sharkle, characters that are as background as characters can get, have their own audio cues for talking. The comedy duo of Garbo and Malloy show up on the television, whether that’s at the train station, at the very beginning of the game, or while Mae watches television with her father. Sharkles exists solely as a companion buddy for Mae’s laptop - akin to Bonzi, of BonziBuddy fame. While this can simply be brushed aside as a budgetary consideration - it’s a dialogue-driven game and the sheer amount of voice-over work that would need to be done would get quite expensive - there are more interesting things to derive from these characters having vocal voices at all. It’s something to take note of because while there are gods, cultists, and the common folk, none of them get a voice. It is only these entities that exist outside of the town that get any consideration in this way. The thing is, they have nothing of importance to say. Garbo and Malloy make a joke of their lives and a fear of failure, but the laugh track underneath undercuts it as anything serious. Sharkle is something that appears within two instances - as a hallucination when the protagonist, Mae, is unconscious, and when clicked on in the computer interface. They ultimately have nothing to say but are the only characters with audible voices. The rest of the game is filled with characters with busy lives who are, literally, silent in their suffering. 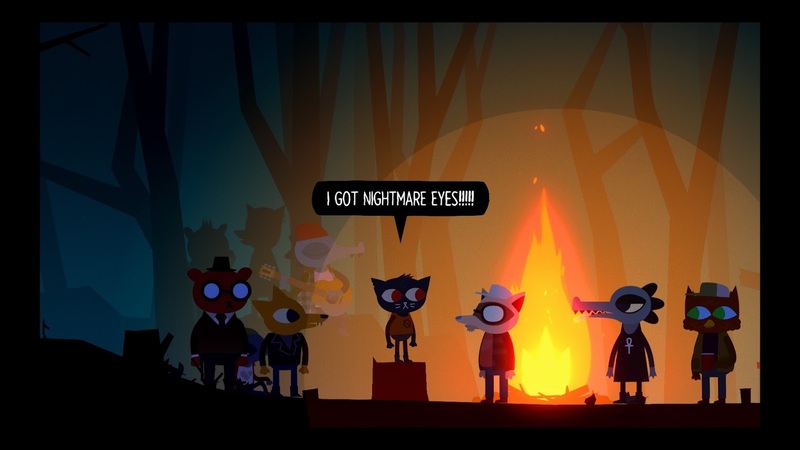 Night In The Woods is set in a rust belt town and deals with Mae Borowski dropping out of college and returning home. There is the expectation that comes with homecoming stories that the protagonist returning to their home will find that they are the mature ones and that they have outgrown their former friends and family. Night In The Woods takes this trope and instead shows a world wherein others have grown up, leaving behind the protagonist who has, in turn, left their old world behind. Economic instability, dead-end jobs, and forgotten and downtrodden workers are the common tale of Possum Springs, the setting of this game. By turning the trope around, and showing these workers as the ones who have matured and grown, it puts the spotlight back on them. With so many characters that share poetry, their plights, dreams - only characters who are not tangible and have nothing to say get to have voices. Despite the focus of the game being upon these people - the player is still someone who is outside of this community and can not hear them. They can only hear the media that surrounds Possum Springs. Sharkle is insignificant. Their influence on the story is a comedic hallucination wherein they tell Mae to get up. When you click on them on the desktop interface, they make a funny sound. They contribute nothing but the voice is what makes them actually stand out. It’s a paradox - they demand attention because they have a voice, but there’s nothing of note or depth to derive from what they are saying. Instead, the only thing worth analyzing of them is why they do have voices. Sharkle embodies the buzz of the internet. It overpowers the voices within these towns. The internet is simultaneously a method to communicate externally, but the sheer size and breadth of it makes actual communication impossible. Garbo & Malloy’s is the basic double act. One character plays the straight man to let the other play the comic. Their jokes deal with their own ratings, employment, and dealing with depression and self-image. It’s fairly basic stuff in the realm of comedy. It is the program that Mae is greeted by when entering the train station upon returning to Possum Springs - the initial action of the game. It is also what Mae and her father watch at the end of her nights. Their voices lack the principles of language, just devolving into rising and falling syllables. They almost have nothing to say, except that’s not entirely true. One of the things that stands out is the closing line of their act is directly related to the next major action in Night In The Woods. For example, there is an instance wherein Malloy says they will join a cult on the next segment. Soon after, Mae encounters the cult of Possum Springs. In another instance, the two proclaim they will be going to therapy and the next day, Mae’s mother sets up an appointment for Mae to go see a therapist. In this sense, they have a predictive power. It is a vague prediction, but a prediction nonetheless. There is a certain predictive power to comedy. Fiction and literature all point to a future, even if they’re rooted in the past. Garbo & Malloy both have this power, but it’s ultimately not as powerful as one would expect. It simply signifies the event will happen - not how to prevent it, survive it, or point to a future after the event. It gets lost in the comedy, so the dire warnings become background noise. Garbo & Malloy’s best efforts are the equivalent of telling someone a train is coming when they’re stuck in the train track. The voices are given to the useless. These characters have nothing of worth to give to the story, but can be heard. It represents the current state of affairs - TV and Internet dominate the consciousness. Night In The Woods is not casting aspersions upon either - it simply is stating that the more important and vital conversations happen locally. The voices that are amplified are highlighted because their message can be seen as broad enough to just dive into uselessness. Media as a whole, even Night In The Woods itself, can not solve the issues of Possum Springs. It comes from work and local effort.